Emerald Ash Borer has invaded the Philadelphia region and is 100% fatal to Ash Trees. Since trees infested with Emerald Ash Borer typically die within 3-5 years, the ISA Certified Arborists at Giroud Tree and Lawn provide homeowners with treatment options and other actions to stop this deadly pest. Ash trees that have been protected with insecticides growing next to untreated ash trees killed by Emerald Ash Borer (photo by Daniel A. Herms, The Ohio State University). Treatment is the only way to control Emerald Ash Borer and save Ash Trees. Treatment or tree removal is the choice many Philadelphia homeowners are facing because Ash trees are under attack from Emerald Ash Borer. A 100% fatal pest, without treatment all Ash Trees with Emerald Ash Borer die within 3-5 years. Giroud Tree and Lawn provides the best actions homeowners can take to protect Ash trees from this killer pest. Considered the most destructive forest pest ever seen in North America according to http://www.emeraldashborer.info/, Emerald Ash Borer kill Ash Trees when the larvae tunnel beneath the bark, stop food and water movement and starve the tree to death. Emerald Ash Borer threatens all Ash trees in Bucks County, Montgomery County PA and parts of Philadelphia. Property owners need to take action now to protect any Ash trees that are a valuable part of the landscape. 1. Have an ISA Certified Arborist survey your property for Ash trees and evaluate overall health. Highest value Ash should be treated with Systemic Trunk injections every two years. Ash of lesser value may warrant a lower cost treatment or be left untreated. 3. Begin treatment at the optimum time and continue treating each tree on the schedule prescribed by the type of treatment. 4. Remove deadwood and promote healthy growth with regular pruning in combination with treatment. 5. Untreated trees may require removal in the future. Giroud Tree and Lawn specializes in tree service, tree removal and lawn care programs that make customers love doing business with the company since 1974. Serving Bucks, Montgomery and Philadelphia Counties, the company offers professional tree and lawn evaluation, tree pruning, tree removal, insect and disease control, fertilizing, stump removal and traditional and 100% organic lawn programs to keep lawns healthy and green . Giroud Arborists are certified by the International Society of Arboriculture (ISA) and have the knowledge and experience required to properly diagnose, treat and maintain trees and lawn health. The company is Accredited by the Better Business Bureau and has been awarded the Angie's List Super Service Award® every year since 2005. The “Giroud Treework for Charity” program donates free tree care services to parks, historical sites and other non-profit organizations located in the Company’s service area. For more information, visit the company website at https://www.giroudtree.com or call 215-682-7704. Emerald Ash Borer Fact SheetEmerald Ash Borer is a 100% fatal pest. 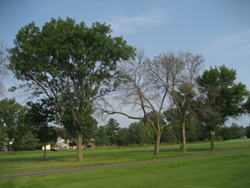 Giroud's Fact Sheet provides information on the pest, Ash trees and treatment options.